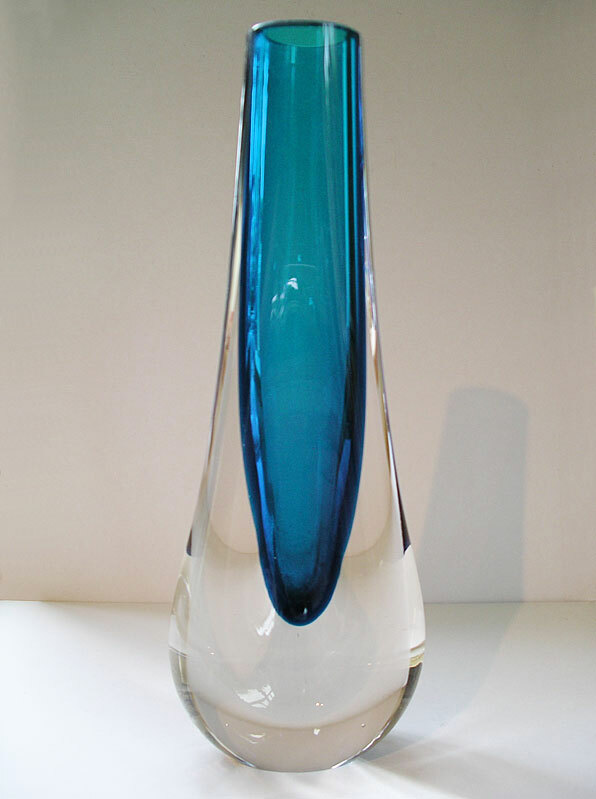 "One of the most beautiful and striking of the Whitefriars cased glass vases from a series designed by Geoffrey Baxter in the 1960s. 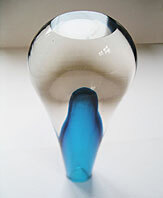 Fabulous hand made oval tapering vase in teardrop shape number 9571 with dimpled sides. 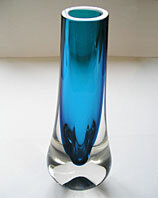 An early example in the colour known simply as Blue cased in clear crystal. Pattern 9571 introduced in 1961 and is illustrated in the 1964 Whitefriars Catalogue page 12. Once easy to find, these Whitefriars and similar postwar art glass pieces are become scarcer and more expensive as they disappear into worldwide collector cabinets and distinctive decor schemes. Don't miss out on this wonderful example." Antiques Expert Hamilton Bear. References: See similar cased glass pieces illustrated in Whitefriars Glass, The Art of James Powell & Sons, Lesley Jackson Ed. , page 137. Dimensions: height 205 mm max. approximately 8 inches. width 76 mm max. Condition: No significant defects in our opinion. We rate this A1 for display and a great example. There is a single light scratch near the neck of the vase that does not impact on the very good visual display qualities of the piece. Some typical light scuffing wear to the underside base as usually found on pieces of this type.